A shared frequency set between the historical mid-latitude aurora records and the global surface temperature – Scafetta (2011) “Herein we show that the historical records of mid-latitude auroras from 1700 to 1966 present oscillations with periods of about 9, 10-11, 20-21, 30 and 60 years. The same frequencies are found in proxy and instrumental global surface temperature records since 1650 and 1850, respectively and in several planetary and solar records. Thus, the aurora records reveal a physical link between climate change and astronomical oscillations. Likely, there exists a modulation of the cosmic ray flux reaching the Earth and/or of the electric properties of the ionosphere. The latter, in turn, have the potentiality of modulating the global cloud cover that ultimately drives the climate oscillations through albedo oscillations. In particular, a quasi 60-year large cycle is quite evident since 1650 in all climate and astronomical records herein studied, which also include an historical record of meteorite fall in China from 619 to 1943. These findings support the thesis that climate oscillations have an astronomical origin. We show that a harmonic constituent model based on the major astronomical frequencies revealed in the aurora records is able to forecast with a reasonable accuracy the decadal and multidecadal temperature oscillations from 1950 to 2010 using the temperature data before 1950, and vice versa. The existence of a natural 60-year modulation of the global surface temperature induced by astronomical mechanisms, by alone, would imply that at least 60-70% of the warming observed since 1970 has been naturally induced. 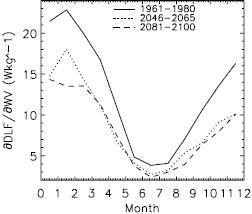 Moreover, the climate may stay approximately stable during the next decades because the 60-year cycle has entered in its cooling phase.” Nicola Scafetta, Journal of Atmospheric and Solar-Terrestrial Physics, doi:10.1016/j.jastp.2011.10.013. A warm Miocene climate at low atmospheric CO2 levels – Knorr et al. (2011) “Proxy records from the Miocene epoch (∼23-5 Ma) indicate a warmer climate than today in spite of lower atmospheric carbon dioxide (CO2) concentrations in the range of preindustrial levels. As yet the simulation of a warm Miocene climate with these low CO2 values has proven to be a challenge. In this study we present climate simulations of the Late Miocene (11-7 Ma) with a preindustrial CO2 level, using a coupled atmosphere-ocean general circulation model (AOGCM). The simulated global mean surface temperature of ∼17.8 °C represents a significantly warmer climate than today. We have analyzed the relative importance of tectonic and vegetation changes as forcing factors. We find that the strongest temperature increase is due to the Late Miocene vegetation distribution, which is more than three times stronger than the impact induced by tectonic alterations. Furthermore, a combination of both forcing factors results in a global temperature increase which is lower than the sum of the individual forcing effects. Energy balance estimates suggest that a reduction in the planetary albedo and a positive water vapor feedback in a warmer atmosphere are the dominating mechanisms to explain the temperature increase. Each of these factors contributes about one half to the global temperature rise of ∼3 K. Our results suggest that a much warmer climate during the Late Miocene can be reconciled with CO2 concentrations similar to preindustrial values.” Knorr, G., M. Butzin, A. Micheels, and G. Lohmann (2011), Geophys. Res. Lett., 38, L20701, doi:10.1029/2011GL048873. Shrinking lakes of the Arctic: Spatial relationships and trajectory of change – Carroll et al. 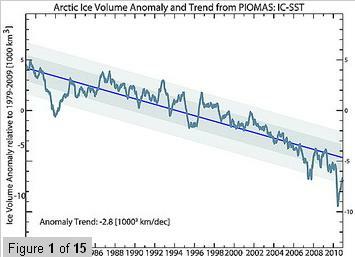 (2011) “Over the past 3 decades the Arctic has seen substantial warming. 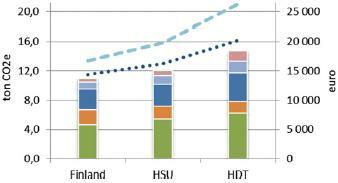 Previous local to regional scale studies have shown a considerable reduction in the size of lakes in this region. The subsequent exposure of carbon- and methane-rich sediments and the direct changes in surface albedo feed back into the drivers of regional and global climate change. Understanding and quantifying changes in the Arctic is a critical component of climate modeling due to the cooling effect of the Arctic on the global climate. The current work utilizes global satellite data from the Moderate Resolution Imaging Spectro-radiometer (MODIS) instrument to investigate changes in lakes across Canada between 2000 and 2009. The results show a net reduction of more than 6,700 km2 in the surface area of water in lakes across Canada. Modest gains in the southern regions are offset by larger losses in surface area farther north. Additionally, spatial analysis shows that the lakes showing change are clustered in groups. This suggests that local variability may play a role in the observed changes. Further work is needed to extend the analysis to the circumpolar Arctic.” Carroll, M. L., J. R. G. Townshend, C. M. DiMiceli, T. Loboda, and R. A. Sohlberg (2011), Geophys. Res. Lett., 38, L20406, doi:10.1029/2011GL049427. Longer growing seasons do not increase net carbon uptake in the northeastern Siberian tundra – Parmentier et al. (2011) “With global warming, snowmelt is occurring earlier and growing seasons are becoming longer around the Arctic. It has been suggested that this would lead to more uptake of carbon due to a lengthening of the period in which plants photosynthesize. To investigate this suggestion, 8 consecutive years of eddy covariance measurements at a northeastern Siberian graminoid tundra site were investigated for patterns in net ecosystem exchange, gross primary production (GPP) and ecosystem respiration (Reco). While GPP showed no clear increase with longer growing seasons, it was significantly increased in warmer summers. Due to these warmer temperatures however, the increase in uptake was mostly offset by an increase in Reco. Therefore, overall variability in net carbon uptake was low, and no relationship with growing season length was found. Furthermore, the highest net uptake of carbon occurred with the shortest and the coldest growing season. Low uptake of carbon mostly occurred with longer or warmer growing seasons. We thus conclude that the net carbon uptake of this ecosystem is more likely to decrease rather than to increase under a warmer climate. These results contradict previous research that has showed more net carbon uptake with longer growing seasons. We hypothesize that this difference is due to site-specific differences, such as climate type and soil, and that changes in the carbon cycle with longer growing seasons will not be uniform around the Arctic.” Parmentier, F. J. W., M. K. van der Molen, J. van Huissteden, S. A. Karsanaev, A. V. Kononov, D. A. Suzdalov, T. C. Maximov, and A. J. Dolman (2011), J. Geophys. Res., 116, G04013, doi:10.1029/2011JG001653. No growth stimulation by CO2 enrichment in alpine glacier forefield plants – Inauen et al. (2011) “Since 1850, glaciers in the European Alps have lost around 40% of their originally glaciated area, releasing bare forefields, which are colonized by alpine pioneer species, setting the scene for later successional stages. These expanding pioneer communities are likely less restricted by resources and competition than late successional systems, we thus hypothesized that rising atmospheric CO2 concentration will enhance plant growth in these high-elevation communities. Nine characteristic, perennial glacier forefield species were assembled in microcosms and grown at a nearby experimental site in the Swiss Alps (2440 m a.s.l.). The communities were exposed to an elevated CO2 concentration of 580 ppm by Free Air CO2 Enrichment (FACE) for three seasons. Four study species were additionally grown in isolation in containers, half of which received a low dose of mineral fertilizer in order to explore a potential nutrient limitation of the CO2 response. Responses of growth dynamics and peak season biomass of the two graminoid species, four forbs and three cushion forming species were analysed by repeated non-destructive assessments and a final biomass harvest. After three seasons, none of the species were stimulated by elevated CO2, irrespective of mineral nutrient addition, which by itself enhanced growth in the fertilized plants by +34% on average. Increased CO2 concentration did not affect total (above- plus belowground) biomass but reduced aboveground biomass by –35% across all species, even in the fast growing ones. This reduced aboveground biomass was associated with higher biomass partitioning to roots. Foliar non-structural carbohydrate (NSC) concentration increased and nitrogen concentration in leaves decreased under elevated CO2. We observed downward adjustment of photosynthetic capacity by on average –26% under long-term exposure to 580 ppm CO2 (assessed in graminoids only). Our results indicate that glacier forefield pioneers, growing under harsh climatic conditions are not carbon limited at current atmospheric CO2 concentration.” Nicole Inauen, Christian Körner, Erika Hiltbrunner, Global Change Biology, DOI: 10.1111/j.1365-2486.2011.02584.x. Hale cycle correlates with surface temperature better than sunspot cycle – new “it’s the sun” meme is born? On the Relationship between Global, Hemispheric and Latitudinal Averaged Air Surface Temperature (GISS Time Series) and Solar Activity – Souza Echer et al. (2011) “The air surface temperature is a basic meteorological parameter and its variation is a primary measure of global, regional and local climate changes. In this work, the global, hemispheric and latitudinal averaged air surface temperature time series, obtained from the NASA/Goddard Institute for Space Studies (GISS), and the Sunspot Number (Rz) for the interval 1880-2005, are decomposed in frequency bands through wavelet multi-resolution analysis. We have found a very low correlation between global, hemispheric and latitudinal averaged air surface temperature and Rz in the 11 yr solar cycle band (8-16 years) from ∼1880 to ∼1950. After wards the correlation is higher. A very significant correlation (R∼0.57 to 0.80) is found in the ∼22 yr solar Hale cycle band (16-32 years) with lags from zero to four years between latitudinal air surface temperature and Rz. Therefore it seems that the 22 yr magnetic field solar cycle might have a higher effect on Earth’s climate than solar variations related to the 11 yr sunspot cycle.” M.P. Souza Echer, E. Echer, N.R. Rigozo, CGM Brum, D.J.R. Nordemann, W.D Gonzalez, Journal of Atmospheric and Solar-Terrestrial Physics, doi:10.1016/j.jastp.2011.10.002. The roles of aerosol, water vapor and cloud in future global dimming/brightening – Haywood et al. (2011) “Observational evidence indicates significant regional trends in solar radiation at the surface in both all-sky and cloud-free conditions. 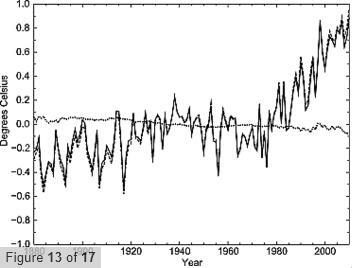 Negative trends in the downwelling solar surface irradiance (SSI) have become known as ‘dimming’ while positive trends have become known as ‘brightening’. We use the Met Office Hadley Centre HadGEM2 climate model to model trends in cloud-free and total SSI from the pre-industrial to the present-day and compare these against observations. Simulations driven by CMIP5 emissions are used to model the future trends in dimming/brightening up to the year 2100. The modeled trends are reasonably consistent with observed regional trends in dimming and brightening which are due to changes in concentrations in anthropogenic aerosols and, potentially, changes in cloud cover owing to the aerosol indirect effects and/or cloud feedback mechanisms. The future dimming/brightening in cloud-free SSI is not only caused by changes in anthropogenic aerosols: aerosol impacts are overwhelmed by a large dimming caused by increases in water vapor. There is little trend in the total SSI as cloud cover decreases in the climate model used here, and compensates the effect of the change in water vapor. In terms of the surface energy balance, these trends in SSI are obviously more than compensated by the increase in the downwelling terrestrial irradiance from increased water vapor concentrations. However, the study shows that while water vapor is widely appreciated as a greenhouse gas, water vapor impacts on the atmospheric transmission of solar radiation and the future of global dimming/brightening should not be overlooked.” Haywood, J. M., N. Bellouin, A. Jones, O. Boucher, M. Wild, and K. P. Shine (2011), J. Geophys. Res., 116, D20203, doi:10.1029/2011JD016000. Acclimation to ocean acidification during long-term CO2 exposure in the cold-water coral Lophelia pertusa – Form & Riebesell (2011) “Ocean acidity has increased by 30% since preindustrial times due to the uptake of anthropogenic CO2 and is projected to rise by another 120% before 2100 if CO2 emissions continue at current rates. Ocean acidification is expected to have wide-ranging impacts on marine life, including reduced growth and net erosion of coral reefs. Our present understanding of the impacts of ocean acidification on marine life, however, relies heavily on results from short-term CO2 perturbation studies. Here we present results from the first long-term CO2 perturbation study on the dominant reef-building cold-water coral Lophelia pertusa and relate them to results from a short-term study to compare the effect of exposure time on the coral’s responses. 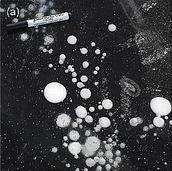 Short-term (one week) high CO2 exposure resulted in a decline of calcification by 26-29% for a pH decrease of 0.1 units and net dissolution of calcium carbonate. In contrast, L. pertusa was capable to acclimate to acidified conditions in long-term (six months) incubations, leading to even slightly enhanced rates of calcification. Net growth is sustained even in waters sub-saturated with respect to aragonite. 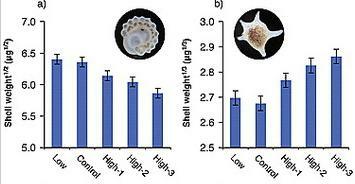 Acclimation to seawater acidification did not cause a measurable increase in metabolic rates. This is the first evidence of successful acclimation in a coral species to ocean acidification, emphasizing the general need for long-term incubations in ocean acidification research. To conclude on the sensitivity of cold-water coral reefs to future ocean acidification further ecophysiological studies are necessary which should also encompass the role of food availability and rising temperatures.” Armin U. Form, Ulf Riebesell, Global Change Biology, DOI: 10.1111/j.1365-2486.2011.02583.x. A pollen-based reconstruction of summer temperature in central North America and implications for circulation patterns during medieval times – Wahl et al. (2011) “We present a reconstruction of mean summer temperature for the northern Midwest of the U.S.A based on lacustrine pollen records from three different lakes in Wisconsin. The results suggest a relatively warm period during the earlier part of the record (~ 1200–1500 CE) followed by a cooler Little Ice Age (~ 1500–1900) and a subsequent warming to modern conditions. The reconstructed modern summer mean temperature is in good agreement with observations, and the decades of the 1930s to 1950s appear to be the warmest such period in the proxy record (through 1974). Analyses of circulation features associated with the warmest summers in the recent climate record suggest a prevalence of continental ridging accompanied by generally dry conditions during extremely warm summers in the Midwest. Drought reconstruction using the Palmer Drought Severity Index (PDSI) and tree-ring records as predictors also yield relatively dry conditions in medieval times for the central US. As reported in a number of recent studies, possible forcing mechanisms include La Niña-like conditions in the equatorial Pacific and warmer than average waters in the tropical Indo-western Pacific Ocean possibly coupled to a positive mode of the AMO/NAO North Atlantic circulation pattern.” Eugene R. Wahl, Henry F. Diaz, Christian Ohlwein, Global and Planetary Change, doi:10.1016/j.gloplacha.2011.10.005. Variation of accumulation rates over the last eight centuries on the East Antarctic Plateau derived from volcanic signals in ice cores – Anschütz et al. (2011) “Volcanic signatures in ice-core records provide an excellent means to date the cores and obtain information about accumulation rates. From several ice cores it is thus possible to extract a spatio-temporal accumulation pattern. We show records of electrical conductivity and sulfur from 13 firn cores from the Norwegian-USA scientific traverse during the International Polar Year 2007–2009 (IPY) through East Antarctica. Major volcanic eruptions are identified and used to assess century-scale accumulation changes. The largest changes seem to occur in the most recent decades with accumulation over the period 1963–2007/08 being up to 25% different from the long-term record. There is no clear overall trend, some sites show an increase in accumulation over the period 1963 to present while others show a decrease. Almost all of the sites above 3200 m above sea level (asl) suggest a decrease. These sites also show a significantly lower accumulation value than large-scale assessments both for the period 1963 to present and for the long-term mean at the respective drill sites. The spatial accumulation distribution is influenced mainly by elevation and distance to the ocean (continentality), as expected. Ground-penetrating radar data around the drill sites show a spatial variability within 10–20% over several tens of kilometers, indicating that our drill sites are well representative for the area around them. Our results are important for large-scale assessments of Antarctic mass balance and model validation.” Anschütz, H., A. Sinisalo, E. Isaksson, J. R. McConnell, S.-E. Hamran, M. M. Bisiaux, D. Pasteris, T. A. Neumann, and J.-G. Winther (2011), J. Geophys. Res., 116, D20103, doi:10.1029/2011JD015753. Arctic winter warming amplified by the thermal inversion and consequent low infrared cooling to space – Bintanja et al. (2011) “Pronounced warming in the Arctic region, coined Arctic amplification, is an important feature of observed and modelled climate change. Arctic amplification is generally attributed to the retreat of sea-ice and snow, and the associated surface-albedo feedback, in conjunction with other processes. In addition, the predominant thermal surface inversion in winter has been suggested to pose a negative feedback to Arctic warming by enhancing infrared radiative cooling. Here we use the coupled climate model EC-Earth in idealized climate change experiments to quantify the individual contributions of the surface and the atmosphere to infrared radiative cooling. We find that the surface inversion in fact intensifies Arctic amplification, because the ability of the Arctic wintertime clear-sky atmosphere to cool to space decreases with inversion strength. Specifically, we find that the cold layers close to the surface in Arctic winter, where most of the warming takes place, hardly contribute to the infrared radiation that goes out to space. Instead, the additional radiation that is generated by the warming of these layers is directed downwards, and thus amplifies the warming. We conclude that the predominant Arctic wintertime temperature inversion damps infrared cooling of the system, and thus constitutes a positive warming feedback.” R. Bintanja, R. G. Graversen & W. Hazeleger, Nature Geoscience(2011), doi:10.1038/ngeo1285. This is a list of papers on the overlap of the the absorption bands of carbon dioxide and water vapor. See also my article on the history of this issue including additional references. The list is not complete, and will most likely be updated in the future in order to make it more thorough and more representative. An improved treatment of overlapping absorption bands based on the correlated k distribution model for thermal infrared radiative transfer calculations – Xu et al. (2009) “This paper discusses several schemes for handling gaseous overlapping bands in the context of the correlated k distribution model (CKD). Commonly used methods are generally based on certain spectral correlation assumptions; thus they are either less accurate or less efficient and rarely apply to all overlapping bands. We propose a new treatment, which we developed from the traditional absorber amount weighted scheme and improved for application to various bands. This approach is quite efficient for treating the gaseous mixture as if it were a “single gas.” Numerical experiments demonstrate that the new scheme achieves high accuracy with a fast operating speed. To validate the new scheme, we conducted spectrally integrated calculations and sensitivity experiments in the thermal infrared region. Compared to line-by-line integration results, errors in cooling rates were less than 0.2 K/day below 70 Km and rose to 1 K/day from above 70 Km up to 100 Km; flux differences did not exceed 0.8 W/m2 at any altitude. Changes in CO2 and H2O concentrations slightly influenced the accuracy of the results.” Guangyu Shi, Na Xu, Biao Wang, Tie Dai, Jianqi Zhao, Journal of Quantitative Spectroscopy and Radiative Transfer, Volume 110, Issue 8, May 2009, Pages 435-451, doi:10.1016/j.jqsrt.2009.01.008. An optimal approach to overlapping bands with correlated k distribution method and its application to radiative calculations – Zhang et al. (2003) “It is found that the possibly achieved higher accuracy cannot be obtained for all overlapping bands if only one scheme is used to treat them in atmospheric absorption calculations. The commonly used multiplication transmittance scheme is not acceptable when correlation existing in the practical absorption spectra becomes strong. Therefore an optimized scheme to obtain k distribution parameters for overlapping bands is developed in this paper based on the completely uncorrelated, perfectly correlated, and partly correlated schemes. Two partial correlation formulae are given in the paper. Calculations of radiative flux and atmospheric heating (or cooling) rate are validated in detail using a line-by-line model described in the paper for six model atmospheres. The optimized scheme developed here has an accuracy in longwave clear skies of 0.07 K d−1 in the entire troposphere and 0.35 K d−1 above the tropopause; the accuracy of upward, downward, and net fluxes is 0.76 W m−2 at all altitudes. In shortwave region, the absolute errors of the heating rate are less than 0.05 K d−1 in the troposphere and less than 0.25 K d−1 above the tropopause; net flux errors are less than 0.9 W m−2 at all altitudes. For an ensemble of 42 diverse atmospheres, the new scheme guarantees an average maximum error of longwave heating rate of 0.068 K d−1 in troposphere, 0.22 K d−1 above tropopause, and an accuracy of 1.1 W m−2 of radiative net flux for all the levels. For a case of doubled CO2 concentration, radiative forcing calculations have an accuracy of 0.04 W m−2.” Zhang, H., T. Nakajima, G. Shi, T. Suzuki, and R. Imasu (2003), J. Geophys. Res., 108(D20), 4641, doi:10.1029/2002JD003358. Uncertainties in Carbon Dioxide Radiative Forcing in Atmospheric General Circulation Models – Cess et al. (1993) A quote from the article: “Fig. 3. (A) Scatter plot of LW clear (clear sky) radiative forcing, as generated by the GCMs, with and without overlap of the C02 absorption bands by water vapor absorption.” R. D. Cess, M.-H. Zhang, G. L. Potter, H. W. Barker, R. A. Colman, D. A. Dazlich, A. D. Del Genio, M. Esch, J. R. Fraser, V. Galin, W. L. Gates, J. J. Hack, W. J. Ingram, J. T. Kiehl, A. A. Lacis, H. Le Treut, Z.-X. Li, X.-Z. Liang, J.-F. Mahfouf, B. J. McAvaney, V. P. Meleshko, J.-J. Morcrette, D. A. Randall, E. Roeckner, J.-F. Royer, A. P. Sokolov, P. V. Sporyshev, K. E. Taylor, W.-C. Wang and R. T. Wetherald, Science 19 November 1993: Vol. 262 no. 5137 pp. 1252-1255, DOI: 10.1126/science.262.5137.1252. Overlapping effect of atmospheric H2O, CO2 and O3 on the CO2 radiative effect – Wang & Ryan (1983)“The effect of overlapping of atmospheric H2O, CO2 and O3 absorption bands on the radiation budget perturbation caused by CO2 doubling is investigated. Since the effect depends on the amount of gases in the atmosphere as well as on the strength of the absorption bands, we examine the effect associated with the variation of gas abundance using a narrow band representation for the absorption bands. This band representation allows for the absorption band structure and thus accounts for the correlation of the spectral feature of the absorbing gases. It is found that the presence of H2O and O3 has a relatively small influence on the CO2-induced perturbation of both solar and thermal radiation in the stratosphere. However, in troposphere and surface, the overlapping effect appears to be quite significant and changes the vertical distribution of the CO2-induced radiation energy perturbation. For example, in the infrared, the effect is to reduce the effectiveness for CO2 to emit and in the mean time increases the tropospheric absorption of downward thermal flux from the stratosphere due to CO2 increase; the net effect of the overlapping of gases is to increase the tropospheric warming and decrease the surface warming caused by CO2 increase. It is also found that the overlapping effect exhibits strong seasonal and latitudinal variations due primarily to variations in atmospheric H2O.” Wei-Chyung Wang, P. Barry Ryan, Tellus B, Volume 35B, Issue 2, pages 81–91, April 1983. Spectral and total emissivity of water vapor and carbon dioxide – Leckner (1972) A quote from abstract: “Total emissivity charts, pressure and overlap corrections based on calculations with spectral data are presented.” B. Leckner, Combustion and Flame, Volume 19, Issue 1, August 1972, Pages 33-48, doi:10.1016/S0010-2180(72)80084-1. Infrared Absorption by Overlapping Bands of Atmospheric Gases – Hoover et al. (1967) “The spectral transmission of carbon monoxide, nitrous oxide, and mixtures of the two has been studied in the 2200-cm-1 region, where overlapping absorption bands occur. With spectral slit widths sufficiently large to include several absorption lines, it was found that the observed spectral transmittance of a mixture is equal to the product of the transmittances of the components measured separately, provided that sufficient nitrogen is added to give the same total pressure for all samples. This result was also obtained for overlapping bands of nitrous oxide and methane in the 1300-cm-1 region. The present work confirms Burch’s earlier studies of overlapping bands of CO2 and water vapor. An investigation of the possible breakdown of the multiplicative property of transmission for narrow spectral slit widths was inconclusive.” D. E. Burch, J. N. Howard, and Dudley Williams, J. Opt. Soc. Am., Vol. 46, Issue 6, pp. 452-455 (1956), doi:10.1364/JOSA.46.000452. Further Studies of Overlapping Absorption Bands – Tubbs et al. (1967) No abstract. D. E. Burch, J. N. Howard, and Dudley Williams, J. Opt. Soc. Am., Vol. 46, Issue 6, pp. 452-455 (1956), doi:10.1364/JOSA.46.000452. Infrared Transmission of Synthetic Atmospheres. V. Absorption Laws for Overlapping Bands – Burch et al. (1956)“Although Lambert’s law Tv=e–kvω presumably applies to the absorption of gases in the infrared, the experimentally observed transmission Tv′ cannot be expressed by a simple relation of this type. It is observed, however, that in regions where the atmospheric carbon dioxide and water vapor absorption bands overlap Tv′(CO2+H2O)= Tv′(CO2)· Tv′(H2O) provided the total pressure P is constant. It is found that the total absorption ƒ Avdv for a synthetic atmospheric sample containing water vapor, carbon dioxide, and nitrogen can be expressed as ƒ AvdV= ƒ Av(H2O)dv+εƒ Av(CO2)dv, where ƒ Av(H2O)dv and ƒ Av(CO2)dv are given by the empirical relations obtained in earlier studies in the present series and ε is a fraction, which can be expressed in terms of the total absorption by water vapor.” D. E. Burch, J. N. Howard, and Dudley Williams, J. Opt. Soc. Am., Vol. 46, Issue 6, pp. 452-455 (1956), doi:10.1364/JOSA.46.000452. An overview of the Global Historical Climatology Network monthly mean temperature data set, version 3 – Lawrimore et al. (2011) “Since the early 1990s the Global Historical Climatology Network-Monthly (GHCN-M) data set has been an internationally recognized source of data for the study of observed variability and change in land surface temperature. It provides monthly mean temperature data for 7280 stations from 226 countries and territories, ongoing monthly updates of more than 2000 stations to support monitoring of current and evolving climate conditions, and homogeneity adjustments to remove non-climatic influences that can bias the observed temperature record. The release of version 3 monthly mean temperature data marks the first major revision to this data set in over ten years. It introduces a number of improvements and changes that include consolidating “duplicate” series, updating records from recent decades, and the use of new approaches to homogenization and quality assurance. Although the underlying structure of the data set is significantly different than version 2, conclusions regarding the rate of warming in global land surface temperature are largely unchanged.” Lawrimore, J. H., M. J. Menne, B. E. Gleason, C. N. Williams, D. B. Wuertz, R. S. Vose, and J. Rennie (2011), J. Geophys. Res., 116, D19121, doi:10.1029/2011JD016187. Trend changes in global greening and browning: contribution of short-term trends to longer-term change – de Jong et al. (2011) “Field observations and time series of vegetation greenness data from satellites provide evidence of changes in terrestrial vegetation activity over the past decades for several regions in the world. Changes in vegetation greenness over time may consist of an alternating sequence of greening and/or browning periods. This study examined this effect using detection of trend changes in Normalized Difference Vegetation Index (NDVI) satellite data between 1982 and 2008. Time series of 648 fortnightly images were analyzed using a trend breaks analysis (BFAST) procedure. Both abrupt and gradual changes were detected in large parts of the world, especially in (semi-arid) shrubland and grassland biomes where abrupt greening was often followed by gradual browning. Many abrupt changes were found around large-scale natural influences like the Mt Pinatubo eruption in 1991 and the strong 1997/98 El Niño event. The net global figure – considered over the full length of the time series – showed greening since the 1980s. This is in line with previous studies, but the change rates for individual short-term segments were found to be up to 5 times higher. Temporal analysis indicated that the area with browning trends increased over time while the area with greening trends decreased. The Southern Hemisphere showed the strongest evidence of browning. Here, periods of gradual browning were generally longer than periods of gradual greening. Net greening was detected in all biomes, most conspicuously in croplands and least conspicuously in needleleaf forests. For 15% of the global land area, trends were found to change between greening and browning within the analysis period. This demonstrates the importance of accounting for trend changes when analyzing long-term NDVI time series.” Rogier de Jong, Jan Verbesselt, Michael E. Schaepman, Sytze de Bruin, Global Change Biology, DOI: 10.1111/j.1365-2486.2011.02578.x. Will climate change exacerbate water stress in Central Asia? – Siegfried et al. (2011) “Millions of people in the geopolitically important region of Central Asia depend on water from snow- and glacier-melt driven international rivers, most of all the Syr Darya and Amu Darya. The riparian countries of these rivers have experienced recurring water allocation conflicts ever since the Soviet Union collapsed. Will climate change exacerbate water stress and thus conflicts? We have developed a coupled climate, land-ice and rainfall-runoff model for the Syr Darya to quantify impacts and show that climatic changes are likely to have consequences on runoff seasonality due to earlier snow-melt. This will increase water stress in unregulated catchments because less water will be available for irrigation in the summer months. Threats from geohazards, above all glacier lake outbursts, are likely to increase as well. The area at highest risk is the densely populated, agriculturally productive, and politically unstable Fergana Valley. Targeted infrastructural developments will be required in the region. If the current mismanagement of water and energy resources can be replaced with more effective resource allocation mechanisms through the strengthening of transboundary institutions, Central Asia will be able to successfully address these future climate-related challenges.” Tobias Siegfried, Thomas Bernauer, Renaud Guiennet, Scott Sellars, Andrew W. Robertson, Justin Mankin, Peter Bauer-Gottwein and Andrey Yakovlev, Climatic Change, DOI: 10.1007/s10584-011-0253-z. Influence of the extent and genera of cloud cover on solar radiation intensity – Matuszko (2011) “This paper aims to describe the influence of cloud cover, its extent and cloud genus, on solar radiation intensity measured at the Earth’s surface. Solar radiation intensity values at varying degrees of cloudiness, based on observations and measurements performed between 2003 and 2007 in Krakow (Poland), are analysed in this paper. Analyses show that cloud cover impacts solar radiation intensity in two ways: usually weakening it, but intensifying in certain weather conditions. The greatest solar radiation intensity can be detected not when the sky is cloudless, but when it is partly cloudy (3/8-6/8), with convective clouds present.” Dorota Matuszko, International Journal of Climatology, DOI: 10.1002/joc.2432. Failure to migrate: lack of tree range expansion in response to climate change – Zhu et al. (2011) “Tree species are expected to track warming climate by shifting their ranges to higher latitudes or elevations, but current evidence of latitudinal range shifts for suites of species is largely indirect. In response to global warming, offspring of trees are predicted to have ranges extend beyond adults at leading edges and the opposite relationship at trailing edges. Large-scale forest inventory data provides an opportunity to compare present latitudes of seedlings and adult trees at their range limits. Using the USDA Forest Service’s Forest Inventory and Analysis (FIA) data, we directly compared seedling and tree 5th and 95th percentile latitudes for 92 species in 30 longitudinal bands for 43,334 plots across the eastern U.S. We further compared these latitudes with 20th century temperature and precipitation change and functional traits, including seed size and seed spread rate. Results suggest that 58.7% of the tree species examined show the pattern expected for a population undergoing range contraction, rather than expansion, at both northern and southern boundaries. Fewer species show a pattern consistent with a northward shift (20.7%) and fewer still with a southward shift (16.3%). Only 4.3% are consistent with expansion at both range limits. When compared with the 20th century climate changes that have occurred at the range boundaries themselves, there is no consistent evidence that population spread is greatest in areas where climate has changed most; nor are patterns related to seed size or dispersal characteristics. The fact that the majority of seedling extreme latitudes are less than those for adult trees may emphasize the lack of evidence for climate-mediated migration, and should increase concerns for the risks posed by climate change.” Kai Zhu, Christopher W. Woodall, James S. Clark, Global Change Biology, DOI: 10.1111/j.1365-2486.2011.02571.x. Radiative forcing of natural forest disturbances – O’Halloran et al. (2011) “Forest disturbances are major sources of carbon dioxide to the atmosphere, and therefore impact global climate. Biogeophysical attributes, such as surface albedo (reflectivity), further control the climate-regulating properties of forests. Using both tower-based and remotely-sensed data sets, we show that natural disturbances from wildfire, beetle outbreaks, and hurricane wind throw can significantly alter surface albedo, and the associated radiative forcing either offsets or enhances the CO2 forcing caused by reducing ecosystem carbon sequestration over multiple years. 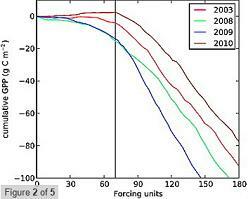 In the examined cases, the radiative forcing from albedo change is on the same order of magnitude as the CO2 forcing. The net radiative forcing resulting from these two factors leads to a local heating effect in a hurricane-damaged mangrove forest in the sub-tropics, and a cooling effect following wildfire and mountain pine beetle attack in boreal forests with winter snow. Although natural forest disturbances currently represent less than half of gross forest cover loss, that area will likely increase in the future under climate change, making it imperative to represent these processes accurately in global climate models.” Thomas L. O’Halloran, Beverly E. Law, Michael L. Goulden, Zhuosen Wang, Jordan G. Barr, Crystal Schaaf, Mathew Brown, José D. Fuentes, Mathias Göckede, Andrew Black, Vic Engel, Global Change Biology, DOI: 10.1111/j.1365-2486.2011.02577.x. Arctic warming on two continents has consistent negative effects on lichen diversity and mixed effects on bryophyte diversity – Lang et al. (2011) “Little is known about the impact of changing temperature regimes on composition and diversity of cryptogam communities in the Arctic and Subarctic, despite the well-known importance of lichens and bryophytes to the functioning and climate feedbacks of northern ecosystems. We investigated changes in diversity and abundance of lichens and bryophytes within long-term (9 -16 yrs) warming experiments and along natural climatic gradients, ranging from Swedish subarctic birch forest and subarctic/subalpine tundra to Alaskan arctic tussock tundra. In both Sweden and Alaska, lichen diversity responded negatively to experimental warming (with the exception of a birch forest) and to higher temperatures along climatic gradients. Bryophytes were less sensitive to experimental warming than lichens, but depending on the length of the gradient, bryophyte diversity decreased both with increasing temperatures and at extremely low temperatures. Among bryophytes, Sphagnum mosses were particularly resistant to experimental warming in terms of both abundance and diversity. Temperature, on both continents, was the main driver of species composition within experiments and along gradients, with the exception of the Swedish subarctic birch forest where amount of litter constituted the best explanatory variable. In a warming experiment in moist acidic tussock tundra in Alaska, temperature together with soil ammonium availability were the most important factors influencing species composition. Overall, dwarf shrub abundance (deciduous and evergreen) was positively related to warming but so were the bryophytes Sphagnum girgensohnii, Hylocomium splendens and Pleurozium schreberi; the majority of other cryptogams showed a negative relationship to warming. This unique combination of intercontinental comparison, natural gradient studies and experimental studies shows that cryptogam diversity and abundance, especially within lichens, is likely to decrease under arctic climate warming. Given the many ecosystem processes affected by cryptogams in high latitudes (e.g. carbon sequestration, N2-fixation, trophic interactions), these changes will have important feedback consequences for ecosystem functions and climate.” Simone I. Lang, Johannes H. C. Cornelissen, Gaius R. Shaver, Matthias Ahrens, Terry V. Callaghan, Ulf Molau, Cajo J. F. ter Braak, Adam Hölzer, Rien Aerts, Global Change Biology, DOI: 10.1111/j.1365-2486.2011.02570.x. Pacific and Atlantic influences on Mesoamerican climate over the past millennium – Stahle et al. (2011) “A new tree-ring reconstruction of the Palmer Drought Severity Index (PDSI) for Mesoamerica from AD 771 to 2008 identifies megadroughts more severe and sustained than any witnessed during the twentieth century. Correlation analyses indicate strong forcing of instrumental and reconstructed June PDSI over Mesoamerica from the El Niño/Southern Oscillation (ENSO). Spectral analyses of the 1,238-year reconstruction indicate significant concentrations of variance at ENSO, sub-decadal, bi-decadal, and multidecadal timescales. Instrumental and model-based analyses indicate that the Atlantic Multidecadal Oscillation is important to warm season climate variability over Mexico. Ocean-atmospheric variability in the Atlantic is not strongly correlated with the June PDSI reconstruction during the instrumental era, but may be responsible for the strong multidecadal variance detected in the reconstruction episodically over the past millennium. June drought indices in Mesoamerica are negatively correlated with gridded June PDSI over the United States from 1950 to 2005, based on both instrumental and reconstructed data. Interannual variability in this latitudinal moisture gradient is due in part to ENSO forcing, where warm events favor wet June PDSI conditions over the southern US and northern Mexico, but dryness over central and southern Mexico (Mesoamerica). Strong anti-phasing between multidecadal regimes of tree-ring reconstructed June PDSI over Mesoamerica and reconstructed summer (JJA) PDSI over the Southwest has also been detected episodically over the past millennium, including the 1950–1960s when La Niña and warm Atlantic SSTs prevailed, and the 1980–1990s when El Niño and cold Atlantic SSTs prevailed. Several Mesoamerican megadroughts are reconstructed when wetness prevailed over the Southwest, including the early tenth century Terminal Classic Drought, implicating El Niño and Atlantic SSTs in this intense and widespread drought that may have contributed to social changes in ancient Mexico.” D. W. Stahle, D. J. Burnette, J. Villanueva Diaz, R. R. Heim, F. K. Fye, J. Cerano Paredes, R. Acuna Soto and M. K. Cleaveland, Climate Dynamics, DOI: 10.1007/s00382-011-1205-z. 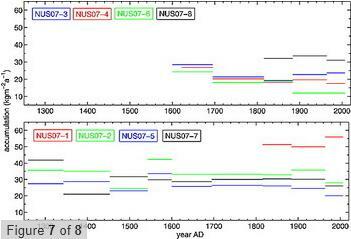 Solar forcing of winter climate variability in the Northern Hemisphere – Ineson et al. (2011) “An influence of solar irradiance variations on Earth’s surface climate has been repeatedly suggested, based on correlations between solar variability and meteorological variables. Specifically, weaker westerly winds have been observed in winters with a less active sun, for example at the minimum phase of the 11-year sunspot cycle. With some possible exceptions, it has proved difficult for climate models to consistently reproduce this signal. Spectral Irradiance Monitor satellite measurements indicate that variations in solar ultraviolet irradiance may be larger than previously thought. Here we drive an ocean–atmosphere climate model with ultraviolet irradiance variations based on these observations. We find that the model responds to the solar minimum with patterns in surface pressure and temperature that resemble the negative phase of the North Atlantic or Arctic Oscillation, of similar magnitude to observations. In our model, the anomalies descend through the depth of the extratropical winter atmosphere. If the updated measurements of solar ultraviolet irradiance are correct, low solar activity, as observed during recent years, drives cold winters in northern Europe and the United States, and mild winters over southern Europe and Canada, with little direct change in globally averaged temperature. Given the quasiregularity of the 11-year solar cycle, our findings may help improve decadal climate predictions for highly populated extratropical regions.” Sarah Ineson, Adam A. Scaife, Jeff R. Knight, James C. Manners, Nick J. Dunstone, Lesley J. 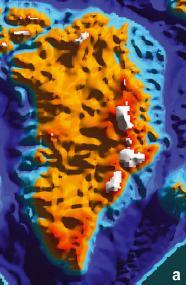 Gray & Joanna D. Haigh, Nature Geoscience, 2011, DOI: doi:10.1038/ngeo1282. This is a list of papers on climate impact on world food supply. Emphasis is on global analysis. The list is not complete, and will most likely be updated in the future in order to make it more thorough and more representative. Food security and global environmental change: emerging challenges – Ericksen et al. (2009) “Most research linking global environmental change and food security focuses solely on agriculture: either the impact of climate change on agricultural production, or the impact of agriculture on the environment, e.g. on land use, greenhouse gas emissions, pollution and/or biodiversity. Important though food production is, many other factors also need to be considered to understand food security. A recent international conference on “Environmental Change and Food Security: Bridging Science, Policy and Development for Adaptation” included a range of papers that embraced the multiple dimensions of the food systems that underpin food security. The major conclusion from the conference was that technical fixes alone will not solve the food security challenge. Adapting to the additional threats to food security arising from major environmental changes requires an integrated food system approach, not just a focus on agricultural practices. Six key issues emerged for future research: (i) adapting food systems to global environmental change requires more than just technological solutions to increase agricultural yields; (ii) tradeoffs across multiple scales among food system outcomes are a pervasive feature of globalized food systems; (iii) within food systems, there are some key underexplored areas that are both sensitive to environmental change but also crucial to understanding its implications for food security and adaptation strategies; (iv) scenarios specifically designed to investigate the wider issues that underpin food security and the environmental consequences of different adaptation options are lacking; (v) price variability and volatility often threaten food security; and (vi) more attention needs to be paid to the governance of food systems.” Polly J. Ericksen, John S.I. Ingram, Diana M. Liverman, Environmental Science & Policy, Volume 12, Issue 4, June 2009, Pages 373-377, doi:10.1016/j.envsci.2009.04.007. Historical Warnings of Future Food Insecurity with Unprecedented Seasonal Heat – Battisti & Naylor (2009) “Higher growing season temperatures can have dramatic impacts on agricultural productivity, farm incomes, and food security. We used observational data and output from 23 global climate models to show a high probability (>90%) that growing season temperatures in the tropics and subtropics by the end of the 21st century will exceed the most extreme seasonal temperatures recorded from 1900 to 2006. In temperate regions, the hottest seasons on record will represent the future norm in many locations. We used historical examples to illustrate the magnitude of damage to food systems caused by extreme seasonal heat and show that these short-run events could become long-term trends without sufficient investments in adaptation.” David. S. Battisti and Rosamond L. Naylor, Science 9 January 2009: Vol. 323 no. 5911 pp. 240-244, DOI: 10.1126/science.1164363. Food Security Under Climate Change – Brown & Funk (2008) “Food insecurity is likely to increase under climate change, unless early warning systems and development programs are used more effectively.” Molly E. Brown and Christopher C. Funk, Science 1 February 2008: Vol. 319 no. 5863 pp. 580-581, DOI: 10.1126/science.1154102. Climate change and world food security: a new assessment – Parry et al. (1999) “Building on previous work quantitative estimates of climate change impacts on global food production have been made for the UK Hadley Centre’s HadCM2 greenhouse gas only ensemble experiment and the more recent HadCM3 experiment (Hulme et al., 1999). The consequences for world food prices and the number of people at risk of hunger as defined by the Food and Agriculture Organisation (FAO, 1988) have also been assessed. Climate change is expected to increase yields at high and mid-latitudes, and lead to decreases at lower latitudes. This pattern becomes more pronounced as time progresses. The food system may be expected to accommodate such regional variations at the global level, with production, prices and the risk of hunger being relatively unaffected by the additional stress of climate change. By the 2080s the additional number of people at risk of hunger due to climate change is about 80 million people (±10 million depending on which of the four HadCM2 ensemble members is selected). However, some regions (particularly the arid and sub-humid tropics) will be adversely affected. A particular example is Africa, which is expected to experience marked reductions in yield, decreases in production, and increases in the risk of hunger as a result of climate change. The continent can expect to have between 55 and 65 million extra people at risk of hunger by the 2080s under the HadCM2 climate scenario. Under the HadCM3 climate scenario the effect is even more severe, producing an estimated additional 70+ million people at risk of hunger in Africa.” Martin Parry, Cynthia Rosenzweig, Ana Iglesias, Günther Fischer, Matthew Livermore, Global Environmental Change, Volume 9, Supplement 1, October 1999, Pages S51-S67, doi:10.1016/S0959-3780(99)00018-7. Climate change and world food supply, demand and trade: Who benefits, who loses? – Fischer et al. (1994) “This paper summarizes the findings of a major interdisciplinary research effort by scientists in 25 countries. The study examined the potential biophysical responses of major food crops to changing atmospheric composition and climate, and projected potential socioeconomic consequences. In a first step crop models were used to estimate how changing climatic conditions might alter yields of major crops at a number of sites representing both major production areas and vulnerable regions at low, mid and high latitudes. Then a dynamic recursive national-level model of the world food system was used to assess socio-economic impacts for the period 1990 up to year 2060.” G. Fischer, K. Frohberg, M.L. Parry, C. Rosenzweig, Global Environmental Change, Volume 4, Issue 1, March 1994, Pages 7-23, doi:10.1016/0959-3780(94)90018-3. Global hot-spots of heat stress on agricultural crops due to climate change – Teixeira et al. (2011) “The productivity of important agricultural crops is drastically reduced when they experience short episodes of high temperatures during the reproductive period. Crop heat stress was acknowledged in the IPCC 4th Assessment Report as an important threat to global food supply. We produce a first spatial assessment of heat stress risk at a global level for four key crops, wheat, maize, rice and soybean, using the FAO/IIASA Global Agro-Ecological Zones Model (GAEZ). A high risk of yield damage was found for continental lands at high latitudes, particularly in the Northern Hemisphere between 40 and 60°N. Central and Eastern Asia, Central North America and the Northern part of the Indian subcontinent have large suitable cropping areas under heat stress risk. Globally, this ranged from less than 5 Mha of suitable lands for maize for the baseline climate (1971–2000) to more than 120 Mha for wetland rice for a future climate change condition (2071–2100) assuming the A1B emission scenario. For most crops and regions, the intensity, frequency and relative damage due to heat stress increased from the baseline to the A1B scenario. However for wheat and rice crops, GAEZ selection of different crop types and sowing dates in response to A1B seasonal climate caused a reduction in heat stress impacts in some regions, which suggests that adaptive measures considering these management options may partially mitigate heat stress at local level. Our results indicate that temperate and sub-tropical agricultural areas might bear substantial crop yield losses due to extreme temperature episodes and they highlight the need to develop adaptation strategies and agricultural policies able to mitigate heat stress impacts on global food supply.” Edmar I. Teixeira, Guenther Fischer, Harrij van Velthuizen, Christof Walter, Frank Ewert, Agricultural and Forest Meteorology, doi:10.1016/j.agrformet.2011.09.002. Contrasting calcification responses to ocean acidification between two reef foraminifers harboring different algal symbionts – Hikami et al. (2011) “Ocean acidification, which like global warming is an outcome of anthropogenic CO2 emissions, severely impacts marine calcifying organisms, especially those living in coral reef ecosystems. However, knowledge about the responses of reef calcifiers to ocean acidification is quite limited, although coral responses are known to be generally negative. In a culture experiment with two algal symbiont-bearing, reef-dwelling foraminifers, Amphisorus kudakajimensis and Calcarina gaudichaudii, in seawater under five different pCO2 conditions, 245, 375, 588, 763 and 907 μatm, maintained with a precise pCO2-controlling technique, net calcification of A. kudakajimensis was reduced under higher pCO2, whereas calcification of C. gaudichaudii generally increased with increased pCO2. In another culture experiment conducted in seawater in which bicarbonate ion concentrations were varied under a constant carbonate ion concentration, calcification was not significantly different between treatments in Amphisorus hemprichii, a species closely related to A. kudakajimensis, or in C. gaudichaudii. From these results, we concluded that carbonate ion and CO2 were the carbonate species that most affected growth of Amphisorus and Calcarina, respectively. The opposite responses of these two foraminifer genera probably reflect different sensitivities to these carbonate species, which may be due to their different symbiotic algae.” Hikami, M., H. Ushie, T. Irie, K. Fujita, A. Kuroyanagi, K. Sakai, Y. Nojiri, A. Suzuki, and H. Kawahata (2011), Geophys. Res. Lett., 38, L19601, doi:10.1029/2011GL048501. 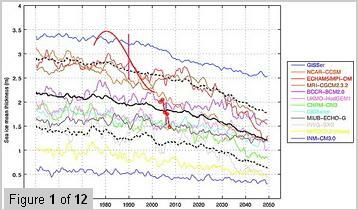 Trends in Arctic sea ice drift and role of wind forcing: 1992–2009 – Spreen et al. 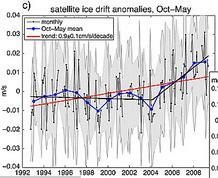 (2011) “We examine the spatial trends in Arctic sea ice drift speed from satellite data and the role of wind forcing for the winter months of October through May. Between 1992 and 2009, the spatially averaged trend in drift speed within the Arctic Basin is 10.6% ± 0.9%/decade, and ranges between −4% and 16%/decade depending on the location. The mean trend is dominated by the second half of the period. In fact, for the five years after a clear break point in March 2004, the average trend increased to 46% ± 5%/decade. Over the 1992–2009 period, averaged trends of wind speed from four atmospheric reanalyses are only 1% to 2%/decade. Regionally, positive trends in wind speed (of up to 9%/decade) are seen over a large fraction of the Central Arctic, where the trends in drift speeds are highest. Spatial correlations between the basin-wide trends in wind and drift speeds are moderate (between 0.40 and 0.52). Our results suggest that changes in wind speed explain a fraction of the observed increase in drift speeds in the Central Arctic but not over the entire basin. In other regions thinning of the ice cover is a more likely cause of the increase in ice drift speed.” Spreen, G., R. Kwok, and D. Menemenlis (2011), Geophys. Res. Lett., 38, L19501, doi:10.1029/2011GL048970. The radiative forcing benefits of “cool roof” construction in California: quantifying the climate impacts of building albedo modification – VanCuren (2011) “Exploiting surface albedo change has been proposed as a form of geoengineering to reduce the heating effect of anthropogenic increases in greenhouse gases (GHGs). Recent modeling experiments have projected significant negative radiative forcing from large-scale implementation of albedo reduction technologies (“cool” roofs and pavements). This paper complements such model studies with measurement-based calculations of the direct radiation balance impacts of replacement of conventional roofing with “cool” roof materials in California. This analysis uses, as a case study, the required changes to commercial buildings embodied in California’s building energy efficiency regulations, representing a total of 4300 ha of roof area distributed over 16 climate zones. The estimated statewide mean radiative forcing per 0.01 increase in albedo (here labeled RF01) is −1.38 W/m2. The resulting unit-roof-area mean annual radiative forcing impact of this regulation is −44.2 W/m2. This forcing is computed to counteract the positive radiative forcing of ambient atmospheric CO2 at a rate of about 41 kg for each square meter of roof. Aggregated over the 4300 ha of cool roof estimated built in the first decade after adoption of the State regulation, this is comparable to removing about 1.76 million metric tons (MMT) of CO2 from the atmosphere. The point radiation data used in this study also provide perspective on the spatial variability of cool roof radiative forcing in California, with individual climate zone effectiveness ranging from −37 to −59 W/m2 of roof. These “bottom-up” calculations validate the estimates reported for published “top down” modeling, highlight the large spatial diversity of the effects of albedo change within even a limited geographical area, and offer a potential methodology for regulatory agencies to account for the climate effects of “cool” roofing in addition to its well-known energy efficiency benefits.” Richard VanCuren, Climatic Change, DOI: 10.1007/s10584-011-0250-2. The climate of North America during the past 2,000 years reconstructed from pollen data – Viau et al. (2011) “The temperature of the warmest month was reconstructed for the past 2000 years using 748 pollen sites from the North American Pollen Database. The modern analogue technique was used to quantify paleoclimate conditions using a modern pollen database with calibration sites from across North America. Across North America, both the Medieval Warm Period (MWP) and Little Ice Age (LIA) were cooler than the present (AD1961-1990). The MWP was warmer than the LIA over at least the boreal and eastern portions of the continent and perhaps across the continent. These reconstructed anomalies during the MWP and LIA are significant anomalies from the long-term neoglacial cooling. The atmospheric circulation was likely dominated by a poleward shift of the summer Subtropical High Pressure system in the North Atlantic during the MWP.” A.E. Viau, M. Ladd, K. Gajewski, Global and Planetary Change, doi:10.1016/j.gloplacha.2011.09.010. Spatial and temporal characteristics of minimum temperature in winter in China during 1961–2010 from NCEP/NCAR reanalysis – Wu et al. (2011) “Based on the surface 2 m monthly minimum temperature from the National Centers for Environmental Prediction/National Center for Atmospheric Research reanalysis dataset, the spatial and temporal characteristics of winter minimum temperature during 1961–2010 have been analyzed in China. Results showed that the minimum temperature in China has a significant increasing rate of 0.25° per decade calculated by the Mann–Kendall statistical test, which is consistent with the global warming trend. Empirical orthogonal function (EOF) analysis reveals that there are three main patterns that can explain more than 57.6% of the total variance of the winter minimum temperature. The EOF1, EOF2, and EOF3 account for 34.8%, 13.5%, and 13.5% of the total inter-annual variance, respectively. The EOF1, EOF2, and EOF3 patterns are synchronous in northern China, central China, and on the Tibetan Plateau. There exist a decrease trend in the corresponding time coefficients of EOF1 and EOF2 and an increase trend in that of EOF3 since the 1960s. 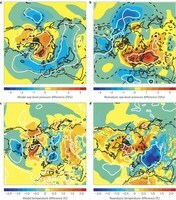 Both the corresponding time coefficients of EOF1 and EOF2 have significant positive correlations with the 500 hPa geopotential heights of the Arctic region and negative correlations in the regions lower than 40°N, while a significant positive correlation is found between the corresponding time coefficients of EOF3 and 500 hPa geopotential heights in the low latitudes. This suggests that rapid warming occurs in northern China and on the Tibetan Plateau, while the weakest trend locates in southeast China. 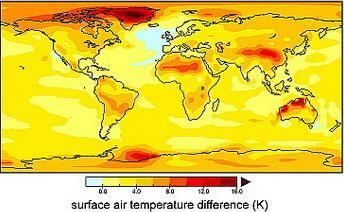 Thus, warming in winter is more pronounced at higher altitudes and latitudes. These patterns are tightly connected with the atmospheric circulation.” Shuhong Wu, Aigang Lu and Longqing Li, Theoretical and Applied Climatology, DOI: 10.1007/s00704-011-0525-6. Lake ice phenology in Berlin-Brandenburg from 1947–2007: observations and model hindcasts – Bernhardt et al. 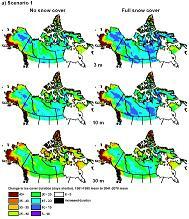 (2011) “Rising northern hemispheric mean air temperatures reduce the amount of winter lake ice. These changes in lake ice cover must be understood in terms of resulting effects on lake ecosystems. Accurate predictions of lake ice phenology are essential to assess resulting impact. We applied the one-dimensional physical lake model FLake to analyse past variability in ice cover timing, intensity and duration of Berlin-Brandenburg lakes. The observed ice phenology in two lakes in the period 1961–2007 was reconstructed by FLake reasonably well and with higher accuracy than by state-of-the-art linear regression models. Additional modelling results of FLake for 38 Berlin-Brandenburg lakes, observed in the winter of 2008/09, were quite satisfactory and adequately reproduced the effects of varying lake morphology and trophic state. Observations and model results showed that deeper and clearer lakes had more ice-free winters, later ice cover freezing and earlier ice cover thawing dates, resulting in shorter ice-covered periods and fewer ice-covered days than shallow and less clear lakes. The 1947–2007 model hindcasts were implemented using FLake for eight Berlin-Brandenburg lakes without ice phenology observations. Results demonstrated past trends of later ice start and earlier ice end, shorter ice cover duration and an increase in ice-free winters.” Juliane Bernhardt, Christof Engelhardt, Georgiy Kirillin and Jörg Matschullat, Climatic Change, DOI: 10.1007/s10584-011-0248-9. Climate-driven trends and ecological implications of event-scale upwelling in the California Current System – Iles et al. (2011) “Eastern boundary current systems are among the most productive and lucrative ecosystems on Earth because they benefit from upwelling currents. Upwelling currents subsidize the base of the coastal food web by bringing deep, cold and nutrient-rich water to the surface. As upwelling is driven by large-scale atmospheric patterns, global climate change has the potential to affect a wide range of significant ecological processes through changes in water chemistry, water temperature, and the transport processes that influence species dispersal and recruitment. We examined long-term trends in the frequency, duration, and strength of continuous upwelling events for the Oregon and California regions of the California Current System in the eastern Pacific Ocean. We then associated event-scale upwelling with up to 21 years of barnacle and mussel recruitment, and water temperature data measured at rocky intertidal field sites along the Oregon coast. Our analyses suggest that upwelling events are changing in ways that are consistent with climate change predictions: upwelling events are becoming less frequent, stronger, and longer in duration. Additionally, upwelling events have a quasi-instantaneous and cumulative effect on rocky intertidal water temperatures, with longer events leading to colder temperatures. Longer, more persistent upwelling events were negatively associated with barnacle recruitment but positively associated with mussel recruitment. However, since barnacles facilitate mussel recruitment by providing attachment sites, increased upwelling persistence could have indirect negative impacts on mussel populations. Overall, our results indicate that changes in coastal upwelling that are consistent with climate change predictions are altering the tempo and the mode of environmental forcing in nearshore ecosystems, with potentially severe and discontinuous ramifications for ecosystem structure and functioning.” Alison C. Iles, Tarik C. Gouhier, Bruce A. Menge, Julia S. Stewart, Alison J. Haupt, Margaret C. Lynch, Global Change Biology, DOI: 10.1111/j.1365-2486.2011.02567.x. Bubbles trapped in arctic lake ice: Potential implications for methane emissions – Wik et al. (2011) “The amount of methane (CH4) emitted from northern lakes to the atmosphere is uncertain but is expected to increase as a result of arctic warming. A majority of CH4 is thought to be released through ebullition (bubbling), a pathway with extreme spatial variability that limits the accuracy of measurements. We assessed ebullition during early and late winter by quantifying bubbles trapped in the ice cover of two lakes in a landscape with degrading permafrost in arctic Sweden using random transect sampling and a digital image processing technique. Bubbles covered up to ∼8% of the lake area and were largely dominated by point source emissions with spatial variabilities of up to 1056%. Bubble occurrence differed significantly between early and late season ice, between the two lakes and among different zones within each lake (p < 0.001). Using a common method, we calculated winter fluxes of up to 129 ± 486 mg CH4 m−2 d−1. These calculations are, on average, two times higher than estimates from North Siberian and Alaskan lakes and four times higher than emissions measured from the same lakes during summer. Therefore, the calculations are likely overestimates and point to the likelihood that estimating CH4 fluxes from ice bubble distributions may be more difficult than believed. This study also shows that bubbles quantified using few transects will most likely be unsuitable in making large-scale flux estimates. 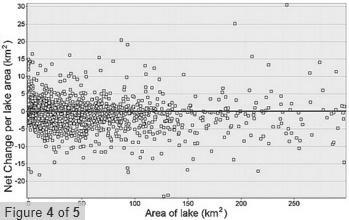 At least 19 transects covering ∼1% of the lake area were required to examine ebullition with high precision in our studied lakes.” Wik, M., P. M. Crill, D. Bastviken, Å. Danielsson, and E. Norbäck (2011), J. Geophys. Res., 116, G03044, doi:10.1029/2011JG001761. IPCC climate models do not capture Arctic sea ice drift acceleration: Consequences in terms of projected sea ice thinning and decline – Rampal et al. 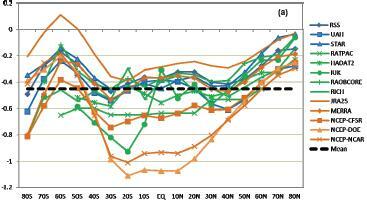 (2011) “IPCC climate models underestimate the decrease of the Arctic sea ice extent. The recent Arctic sea ice decline is also characterized by a rapid thinning and by an increase of sea ice kinematics (velocities and deformation rates), with both processes being coupled through positive feedbacks. In this study we show that IPCC climate models underestimate the observed thinning trend by a factor of almost 4 on average and fail to capture the associated accelerated motion. The coupling between the ice state (thickness and concentration) and ice velocity is unexpectedly weak in most models. In particular, sea ice drifts faster during the months when it is thick and packed than when it is thin, contrary to what is observed; also models with larger long-term thinning trends do not show higher drift acceleration. This weak coupling behavior (1) suggests that the positive feedbacks mentioned above are underestimated and (2) can partly explain the models’ underestimation of the recent sea ice area, thickness, and velocity trends. Due partly to this weak coupling, ice export does not play an important role in the simulated negative balance of Arctic sea ice mass between 1950 and 2050. 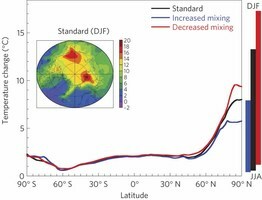 If we assume a positive trend on ice speeds at straits equivalent to the one observed since 1979 within the Arctic basin, first-order estimations give shrinking and thinning trends that become significantly closer to the observations.” Rampal, P., J. Weiss, C. Dubois, and J.-M. Campin (2011), J. Geophys. Res., 116, C00D07, doi:10.1029/2011JC007110. Radiocarbon bomb spike reveals biological effects of Antarctic climate change – Clarke et al. (2011) “The Antarctic has experienced major changes in temperature, wind speed and stratospheric ozone levels during the last 50 years. However until recently continental Antarctica appeared to be little impacted by climate warming, thus biological changes were predicted to be relatively slow. Detecting the biological effects of Antarctic climate change has been hindered by the paucity of long-term data sets, particularly for organisms that have been exposed to these changes throughout their lives. We show that radiocarbon signals are preserved along shoots of the dominant Antarctic moss flora and use these to determine accurate growth rates over a period of several decades, allowing us to explore the influence of environmental variables on growth and providing a dramatic demonstration of the effects of climate change. We have generated detailed 50-year growth records for Ceratodon purpureus and three other Antarctic moss species using the 1960s radiocarbon bomb spike. Our growth rate and stable carbon isotope (δ13C) data show that C. purpureus’ growth rates are correlated with key climatic variables, and furthermore that the observed effects of climate variation on growth are mediated through changes in water availability. Our results indicate the timing and balance between warming, high wind speeds and elevated UV fluxes may determine the fate of these mosses and the associated communities that form oases of Antarctic biodiversity.” Laurence J. Clarke, Sharon A. Robinson, Quan Hua, David J. Ayre, David Fink, Global Change Biology, DOI: 10.1111/j.1365-2486.2011.02560.x. Climate Change and Spotted Owls: Potentially Contrasting Responses in the Southwestern United States – Peery et al. (2011) “Developing strategies that reduce the impacts of climate change on biodiversity will require projections of the future status of species under alternative climate change scenarios. Demographic models based on empirical data that link temporal variation in climate with vital rates can improve the accuracy of such predictions and help guide conservation efforts. Here we characterized how population dynamics and extinction risk might be affected by climate change for three spotted owl (Strix occidentalis) populations in the Southwestern United States over the next century. Specifically, we used stochastic, stage-based matrix models parameterized with vital rates linked to annual variation in temperature and precipitation to project owl populations forward in time under three IPCC emissions scenarios relative to contemporary climate. Owl populations in Arizona and New Mexico were predicted to decline rapidly over the next century and had a much greater probability of extinction under all three emissions scenarios than under current climate conditions. In contrast, owl population dynamics in Southern California were relatively insensitive to predicted changes in climate, and extinction risk was low for this population under all scenarios. The difference in predicted climate change impacts between these areas was due to negative associations between warm, dry conditions and owl vital rates in Arizona and New Mexico, whereas cold, wet spring reduced reproduction in Southern California. Predicted changes in population growth rates were mediated more by weather-induced changes in fecundity than survival, and were generally more sensitive to increases in temperature than declines in precipitation. Our results indicated that spotted owls in arid environments may be highly vulnerable to climate change, even in core parts of the owl’s range. More broadly, contrasting responses to climate change among populations highlight the need to tailor conservation strategies regionally, and modeling efforts such as ours can help prioritize the allocation of resources in this regard.” M. Zachariah Peery, R. J. Gutiérrez, Rebecca Kirby, Olivia E. LeDee, William LaHaye, Global Change Biology, DOI: 10.1111/j.1365-2486.2011.02564.x. Uncertainty in modeled Arctic sea ice volume – Schweiger et al. (2011) “Uncertainty in the Pan-Arctic Ice-Ocean Modeling and Assimilation System (PIOMAS) Arctic sea ice volume record is characterized. A range of observations and approaches, including in situ ice thickness measurements, ICESat retrieved ice thickness, and model sensitivity studies, yields a conservative estimate for October Arctic ice volume uncertainty of 1.35 × 103 km3 and an uncertainty of the ice volume trend over the 1979–2010 period of 1.0 × 103 km3 decade–1. A conservative estimate of the trend over this period is −2.8 × 103 km3 decade–1. PIOMAS ice thickness estimates agree well with ICESat ice thickness retrievals (<0.1 m mean difference) for the area for which submarine data are available, while difference outside this area are larger. PIOMAS spatial thickness patterns agree well with ICESat thickness estimates with pattern correlations of above 0.8. PIOMAS appears to overestimate thin ice thickness and underestimate thick ice, yielding a smaller downward trend than apparent in reconstructions from observations. PIOMAS ice volume uncertainties and trends are examined in the context of climate change attribution and the declaration of record minima. The distribution of 32 year trends in a preindustrial coupled model simulation shows no trends comparable to those seen in the PIOMAS retrospective, even when the trend uncertainty is accounted for. Attempts to label September minima as new record lows are sensitive to modeling error. However, the September 2010 ice volume anomaly did in fact exceed the previous 2007 minimum by a large enough margin to establish a statistically significant new record.” Schweiger, A., R. Lindsay, J. Zhang, M. Steele, H. Stern, and R. Kwok (2011), J. Geophys. Res., 116, C00D06, doi:10.1029/2011JC007084.